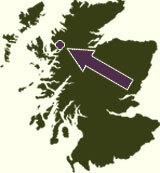 The Estate is less than 1½ hours drive from Inverness (and Inverness international airport) and 1½ hours from The Isle of Skye. Ben Damph is situated between Shieldaig and Torridon, and not far from Applecross, in Wester Ross. House location is beside (south of) the river Thrail a quarter of a mile east of where it joins the river Torridon, near to the hamlet of Annat. Note that the above form will redirect users to the Google Maps website. Ben Damph Estate is not responsible for the accuracy of the directions given.